Once upon a time, there was a woman named Teresa who loved doughnuts. The end. That’s it. I could stop writing this blog post right now and everything would have been said. 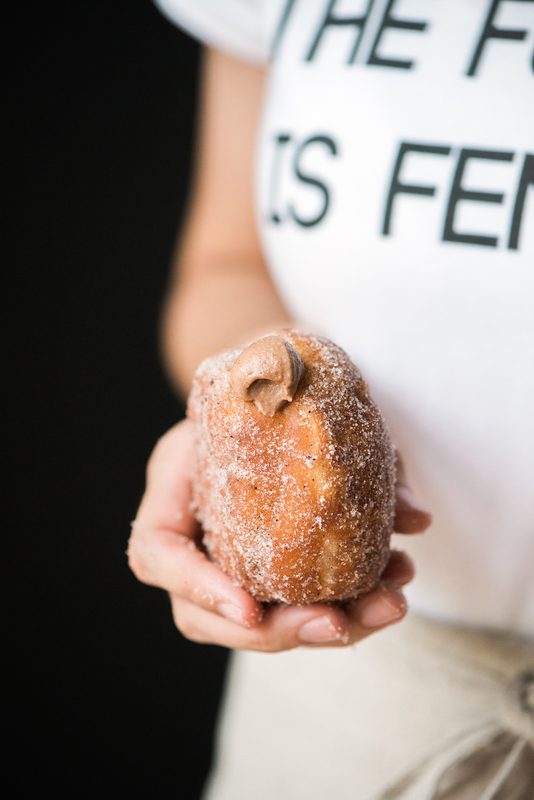 All the words that come after that statement all mean the same thing: I LOVE DOUGHNUTS. As a small child, one of my very first food memories is of my father treating my sisters and I to them at a popular doughnut chain in a nearby city. My head barely reached the shop counter top, but my eyes were still able to see the powdery white doughnuts stuffed with “chocolate cream” filling resting high on the shelf behind the counter. Oh man, I can still feel the excitement and nothing made me behave better than knowing my reward would be a chocolate stuffed doughnut. 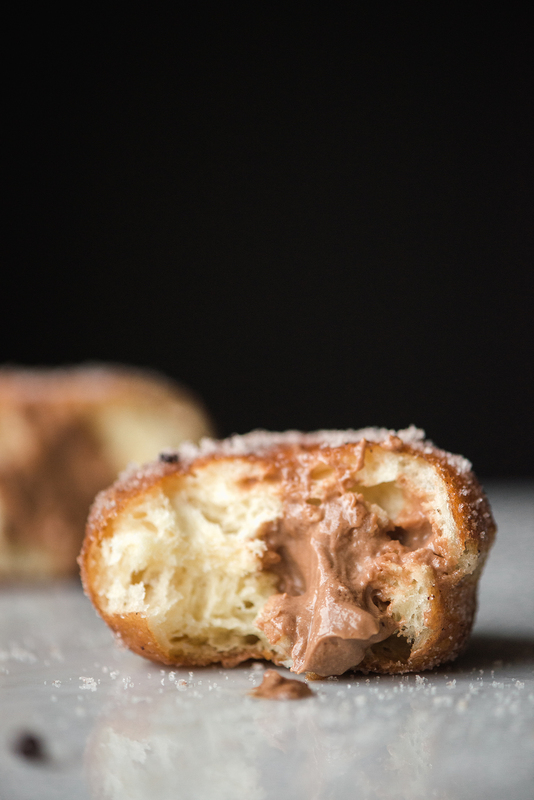 Since then, my taste in doughnuts has become more refined; however, a well-made chocolate cream filled doughnut remains high on my fried dough pedestal. After taking an Instagram vote on which flavor of filled doughnut to make for the blog, I was thrilled that this Chocolate Custard Cream Doughnut with cacao nib sugar won. It was close you guys, but you made the right choice. I made a few versions of this doughnut dough over the past two weeks and finally nailed it down to the perfect combination. A dough that’s sturdy enough to hold a thick and luscious filling, yet still fluffy enough to not feel heavy. For the filling, the only way to go was with a custard. Custards are a cooked mixture of milk or cream and egg yolks; which means whatever is made with it is probably going to be pretty great (i.e. ice cream, pudding, etc.). This particular custard is a chocolate pastry cream (a custard that’s been thickened using flour or cornstarch) and has been lightened to an ethereal texture with whipped cream. Then, for the finale it’s rolled in a cacao nib sugar. A sugar that’s been infused with more chocolate in the form of pulverized cacao nibs. What’s not to love? Also, you get two-recipes-for-one today, because the dough scraps make doughnut holes that can be rolled in the cacao nib sugar. You’re welcome. This recipe is probably one of my favorite recipes that I’ve shared on the blog, so hopefully you love them as much as we did. May it bring you some happy food memories of your own. *Prepare the chocolate custard before making the doughnuts. It needs a good amount of time to chill in the refrigerator to thicken up. 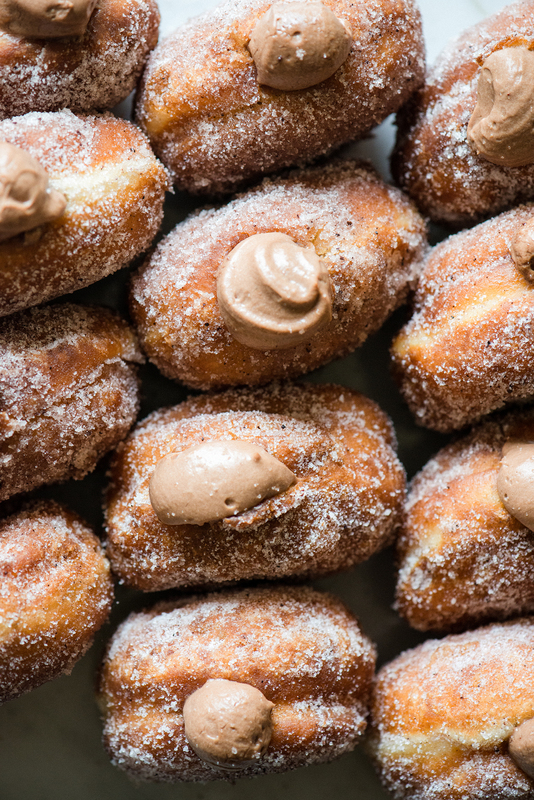 For example, when making these doughnuts for the weekend, I’ll make the custard on a Friday and then let it hang out in the refrigerator until I make the doughnuts on Saturday or Sunday. Or, you could make the custard in the morning and make the doughnuts in the evening. Whatever works, only let it have that cooling period so it gets nice and thick. *You’ll be tempering egg yolks in this recipe and it’s nothing to sweat about. It’s a simple process of whisking in hot milk, a little at a time, in order to slowly raise the temperature of the yolks and keep them from scrambling. Here’s a helpful video that shows what tempering eggs looks like. There are a few different ways to do it, but in this recipe I have you ladle in all the milk before returning it to the saucepan. Super easy. *Doughnut holes ALERT! 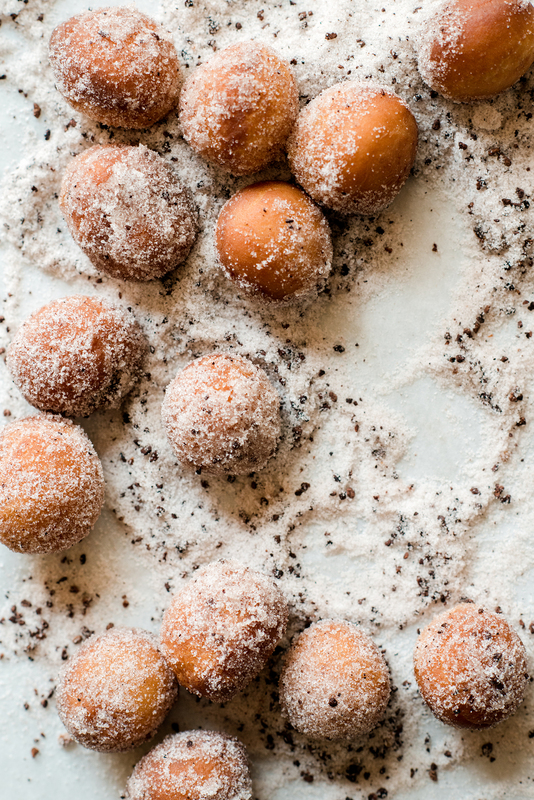 Use the leftover dough scraps to fry up doughnut holes and then roll them in the cacao nib sugar. Use these to tide yourself over while waiting for the main doughnuts to cool completely before filling. In a food processor, grind the cacao nibs until very fine with no large pieces remaining. Combine the pulverized cacao nibs and sugar. Transfer to an airtight container until ready to use. Cacao nib sugar will store for a long time, several months up to a year or more, and become stronger in flavor as the nibs infuse the sugar over time. In a heat-proof bowl, gently melt the dark chocolate over a double boiler (a pot of simmering water with the chocolate bowl snuggly fitted on top). Or, place the bowl of chocolate in the microwave and melt in 30 second intervals, stirring between each heating, just until melted. Take care not to burn the chocolate with the microwave method. In a small bowl, whisk together egg yolks, first portion of sugar, and cornstarch. In a medium-sized saucepan bring the milk to a simmer. While whisking, slowly stream in a ladle-full of the hot milk into the egg mixture. Continue to whisk and add hot milk until all combined. Transfer the custard mixture back into the saucepan and set over medium-high heat. Whisking constantly to prevent scorching, cook the custard until it begins to thicken and boil. Boil for 2-minutes, whisking the entire time, until custard resembles a thick pudding-like consistency. Remove saucepan from heat and whisk in butter and vanilla extract. Whisk in the melted chocolate. Strain the chocolate custard through a sieve and into a clean bowl. Cover the surface directly with plastic wrap to prevent a skin from forming. Set in the refrigerator until completely cooled and very thick, at least 4 hours or overnight. Store chocolate custard, in the refrigerator, for up to three days. When the doughnuts are ready to be filled, prepare the chocolate custard cream by whipping the heavy cream and 1/2 tsp sugar to soft peaks. Using a spatula, loosen up the chilled chocolate custard by spreading it around until it’s smooth with no lumps. Fold one-third of the whipped cream into the chocolate custard and then fold in the remaining whipped cream. Warm the milk in the microwave until it’s room temperature and slightly warm to the touch (not hot), about 30 seconds. Pour the milk into the bowl of a stand mixer and sprinkle on the yeast; whisk lightly to combine. In a separate bowl, combine the flours, sugar, and salt. Add the dry flour mixture, egg, and soft butter to the stand mixture bowl. Using the dough hook attachment, mix the dough on low-speed until combined. Increase to medium-speed and continue to mix dough for another 6-8 minutes. Stop and scrape down the sides and bottom of the bowl as needed. The final dough will be soft and tacky. Transfer the dough to a large bowl and cover the bowl with plastic wrap. Set aside in a warm spot on the counter and allow dough to rise until doubled in size, about 30 minutes. Meanwhile, prepare a deep fryer with oil and heat to 350F (177C) for frying the doughnuts. Or, fill a large heavy-bottomed pot with at least 2-inches of oil and attach a deep fry thermometer to the inside. Place a cooling rack onto a large baking sheet for cooling the doughnuts and fill a large bowl with the cacao nib sugar. Transfer the dough onto a well-floured work surface and sprinkle the top of the dough with more flour. To prevent sticking, flour your rolling pin and roll out dough to 1/2-inch thick. Using a 3-inch round cutter, cut out 12 doughnut rounds. Reserve the dough scraps for making doughnut holes. Cover the dough rounds lightly with plastic wrap. Fry the doughnuts two at a time, for 2 minutes on each side, until deeply golden brown. Transfer to the prepared baking sheet and let cool for 1 minute. 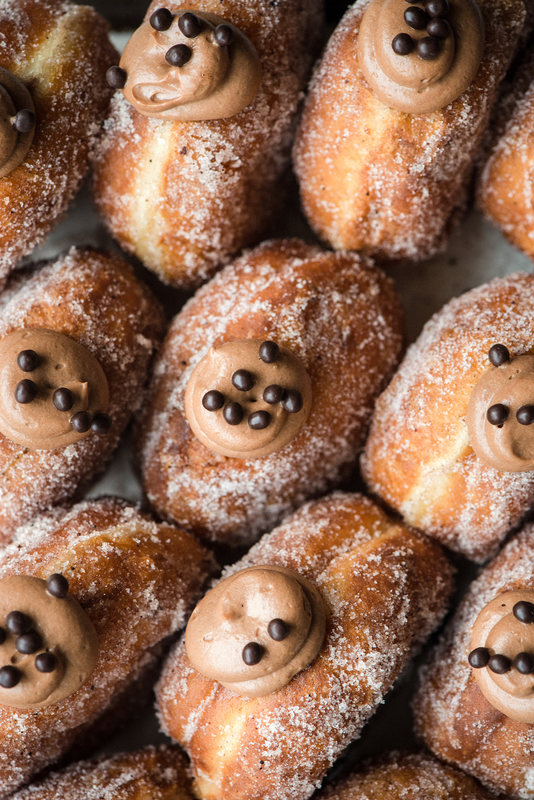 Pierce the side of each doughnut with a pairing knife and then roll one doughnut at a time in the cacao nib sugar. Place back on the cooling rack. Allow the fryer oil to reheat to 350F (177C) before repeating the process with the remaining doughnuts. Allow doughnuts to cool completely before filling, about 1-2 hours. When finished, cut out small rounds from the dough scraps and fry them up as doughnut holes. Turn the holes regularly in the oil as they fry up quickly. Then, roll them in the remaining cacao nib sugar. Fit a pastry bag with a small round pastry tip (I used an Ateco 805) and fill the bag with chocolate custard cream. Place the tip into the pierced side of the doughnut and pipe in the cream until the doughnut’s sides puff up and the cream rises back out of the pierced hole. Repeat the filling process with the remaining doughnuts. Sprinkle on any additional toppings if desired and serve immediately. Holy heavens!!! These photos are drool-worthy. All the heart eyes for these doughnuts! Seriously stunning! Thank you! You should definitely make these sometime. So good. These doughnuts are absolute perfection! oh my gosh, these look heavenly. Thank you, Julia! Stuffed doughnuts are my weakness. Wow, Teresa those photos are just decadent! I’m not good at making desserts but your recipe is so easy! I’m so impressed! Hi Theresa..I love this recipe thanks for sharing! One question how long should we proof the doughnut rounds before frying? Hi Ai! Good question. The dough only needs the 30 minute rise period and no proofing. The doughnuts puff up nice and fluffy even without the proof. Hope you enjoy them!